This is my first time participating in a contest that rely on pure creativity. 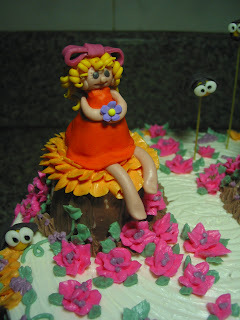 Playing with buttercream contest is held by Mbak Anne. The extraordinary thing about this contest is The PRIZE.... Frankly, I have never heard before an online contest especially for hobbies give prizes away for the winner. The first thing that come to my mind was to make a Flower Fairy In the Forest. For the fairies, I followed the step by step at Clay books by Indira. 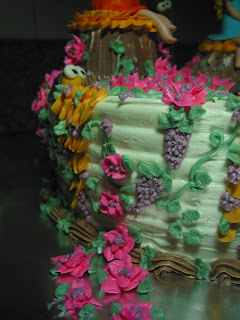 For the flowers, I used butter cream(Lha namanya juga contest playing with buttercream getooo :D) and I used tip #104 and piping bag which its point I cut into reverse V.
Well, do I a good player in butter cream? What do you think guys? 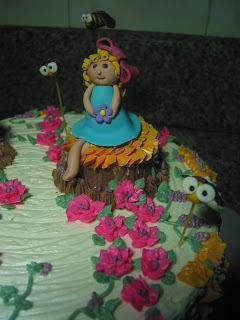 If, you think my cake design is good then please VOTE ME to support me. (ngarep.com banget deh...:D). Just simple leave your comment to this post. Special thanks to Mbak Anne for hosting such a great event so I could spend some times to practise with butter cream. Keep up the good work ya Mbak. Makasi ya say utk partisipasinya. Masih takjub niy. lucu hiasannya dan warnanya oke bangets..
bagus banget, sampai terbengong-bengong liatnya .. sukses terus ya n salam kenal..